Beautiful condo is located in sunny southern California on Ensenada Court, just steps to Mission Bay, the Pacific Ocean/Mission Beach and Balboa Park. Located on the bay side of South Mission Beach in a quiet neighborhood. Home has a big kitchen, gas bar-b-que, and large rooftop deck. Park in tandem garage or in the Belmont parking lot just steps away. Everything you need to spend a great week in San Diego with great weather year round. Enjoy the sunrise on the bay and the amazing sunset from the beach. Sea World is so close you can see the tower from the roof top deck and watch fireworks on summer evenings. You also have great rooftop views of the Ocean, bay, and the roller coaster at Belmont Park. Walk or bike to everything you need for the week or take your car to downtown San Diego for great nightlife and wonderful restaurants only 10 minutes away. The world renowned San Diego Zoo is a quick drive. Legoland is about 30 minutes and Disneyland is about 1-1/2 hours away. Clean and Beautiful: This is a new condo and everything is new and top of the line. Cute beach decor throughout. Lots of dishes, pots and pans, and kitchen essentials. Includes dishes for kids, a highchair, pack-n-play, children's picnic table and jogging stroller. Bring your family and enjoy the beach! Enjoy the Beach: There are four beach cruisers (one with a child seat) and a jogging stroller to enjoy the boardwalk. Beach umbrella's, beach chairs, towels, blankets, ice chests and sand toys to enjoy the beach. All you need is a swimsuit and sunscreen. Growing up in Arizona, we both have great memories of vacations in Southern California. We also lived in Mission Viejo when our kids were young and after moving back to Arizona, we decided that we would eventually have a place by the beach at some point in our lives. We now spend 6-8 weeks here in the summer and allow others to enjoy our home away from home the rest of the time. After vacationing in Mission Beach and Newport for many years, we decided to buy a place in Mission Beach where we could be close to all of the activities, but not right on the beach with all of the noise and people that go with it. Our family loves spending time here in the summer and the fact that we can literally spend a whole week and never get into a car, either walking or riding bikes everywhere that we want to go. Beautiful granite counters and travertine in bath & shower areas. Plush new towels. Choose between Mission Beach with nice waves and Mission Bay with no waves for the younger kids. Only 100 yards to the quiet beaches of South Mission Beach for surfing of sun bathing, or watch the volleyball tournaments at the south end of the beach. 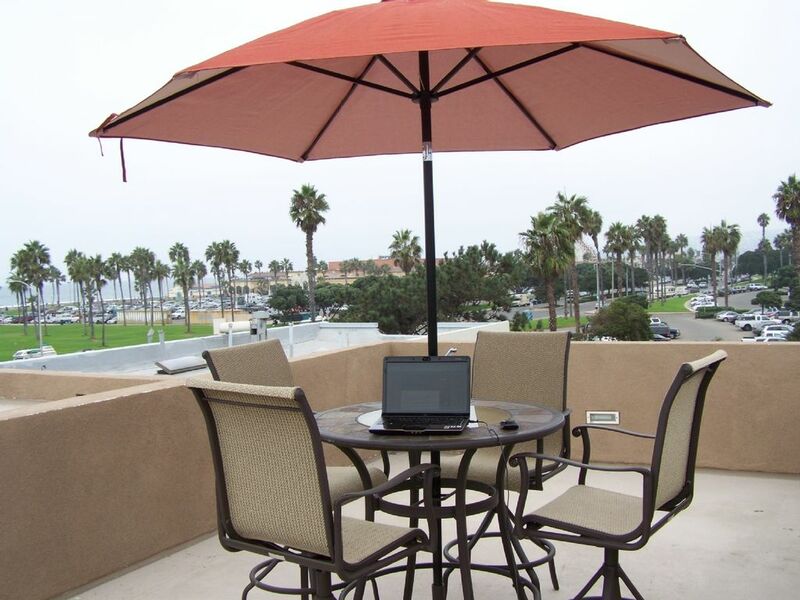 Great views of Mission Beach, Mission Bay and Belmont Park from the roof top deck. See fireworks nightly in the summer at Sea World less than a half mile away. Watch the boats coming and going from Mission Bay to the ocean and kite surfers on the Bay. Tandem garage (one car in front of the other, but the front is taken up by 6-8 bikes. Still leaves room for a car or mid size SUV. Parking available in Belmont Park parking lot 100 feet away. Plenty of towels in both baths, plus beach towels in the garage. With water and ice dispensers. Spices, cooking oil, sugar, sweetner, salt & pepper. Four adult beach bikes and multiple sizes of kids bikes from 16' to 20'. Boogie Boards, Skim Boards, Beach Toys. 25 golf courses within 30 minutes. Weekly memberships available at the Belmont Park indoor swimming pool. Baby gate, children's picnic table and bed rail also provided. This was a beautifully finished 3 level with multiple patios and a rooftop deck. Everything is so organized and if you have any questions there is a book of instructions. Our Tahoe didn't fit in the garage, but we could always find a parking spot. There was plenty of room for the six of us which included two adults, three teenage boys all over 6' and a 16 year old girl. We loved the location, all of the bikes and the proximity to everything. We walked or rode the bikes everywhere for a week. It was a true vacation. You can tell they care about their home and its upkeep, and they give you the tools to keep it clean. The master bed was really comfortable, I loved the large shower. The towels were really good quality and the linens were too. We had the windows open the whole week, we loved the break from constant A/C in Utah. The beach is beautiful. The rooftop deck was to die for! The teenagers were a little bummed that there aren't fireworks at night anymore at Sea World. (I liked not having fireworks) This is a beautiful and safe unit that I felt right at home in. Overall, this is my favorite VRBO property I have stayed in. Thank you Margaret and Warren for letting us stay at in your home! We will be back! The condo was beautiful and very clean! My family and I enjoyed our stay, close to so many things to see and do, we hope to be back again next year. Great location and the condo is just beautiful! The full-time residents in the area are wonderful people to visit with, especially "Richard"! The furnishings are EXACTLY as shown, and these owners go out of their way to provide a wonderful alternative to a resort. These kind people treat their vacation renters as visiting friends or family; every possible thing one could think of is provided including spices, bicycles, beach towels and cooking utensils for an entire family. As a former long-term resident of the San Diego area, this condo fit the bill perfectly for my daughter, son-in-law and teen grandchildren so that I could show them the beautiful city of my childhood. It's centrally located, close to everything including the beach! The only "down side", which is far from the owners' control, are the "Dumpster Divers" that go through one's trash night and day. This unfortunately is common to any of the beach areas; but they seem to be harmless and when asked to stop and go away, they did. I would highly recommend this condo to ANYONE and thank these wonderful owners again for such a wonderful, generous, safe and enjoyable stay! We absolutely loved our stay here! The house was immaculately cleaned and organized--they had everything we needed, including beach towels, toys, chairs, and bikes. We enjoyed the rooftop patio with its ocean and bay view. Each night we watched the Seaworld fireworks from there. Everything we wanted to do was easily accessible from the house by foot, bike, or car. The Mission had a delicious brunch! The owners' communication is timely, helpful and welcoming. The manual they left contained everything we needed to know. Hands down, we would stay here again and recommend it to our friends and family. Thank you for sharing your beautiful home with us! The perfect place to stay in San Diego! This is the perfect place to stay in San Diego, especially for families! It is a short walk to the beach, and an even shorter walk to the bay. The condo has absolutely everything you need, and even more that you didn't know you needed but were so glad was there! The layout is great and is very clean. The rooftop deck is great for eating, lounging, playing and watching fireworks from. We would recommend this place to anyone. Warren is wonderful to work with and everything was exactly as we expected, and even more! We had the best vacation there! Summer rentals are Saturday to Saturday only.